Salvatore’s: Enjoy Signature Flatbread Pizzas for $3.14 in the bar area on 3.14 from 2-6pm at all five Salvatore’s locations. Zoo New England (Franklin Park Zoo Only): Tickets purchased online on 3.14.14 with promo code PiDayFPZ will be discounted at 31.4%. There will be 314 tickets available at the discount price, and they are only valid Friday, March 14 to Sunday, March 16, 2014. Beacon Hill Bistro: Pie for breakfast your thing? Stop by Beacon Hill Bistro to grab a slice of pie for $3.14 during breakfast service from 7:00AM to 10:00AM, while supplies last. Petsi Pies: Stop into Petsi Pies at 1:59pm on 3.14 to enter the free pie competition. 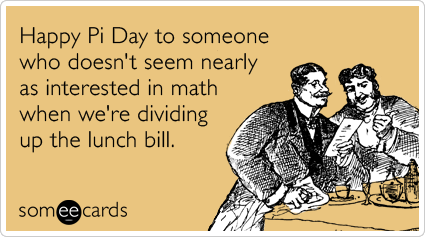 Simply verbally recite at least 10 digits of Pi to win a pie! You can do it! *Note: I know you (and me) like to be directed to the source for more information to make sure the deals are legit but I don’t have direct links for the first three deals. However, they were sent directly to my inbox so they should work no problem.